Nusa Lembongan is one of the sub districts of Klunkung. Nusa Lembongan’s population is almost 5000. The low population makes it a peaceful area to visit. It is not like a tourist spot where you may find thousands of people. It is a place where you can simply lay down on the white sand and relish every moment with peace and comfort. The weather on this island is ideal. The island possesses low limestone cliffs and mostly low tides crash against them. The view from this island is great to watch. Nusa Lembongan is spread about 8 square kilometers. The JungutBatu and Mushroom Bay are the main places to explore in Nusa Lembongan. These two are known to be the tourist spots on the island. Almost 70% of the population of the island is found in these two tourist spots. All the fun activities, food and accommodation facilities are provided at the JunguBatu and Mushroom Bay. The island also possesses a mangrove forest in the northeast. The people living on this island depend upon agriculture, tourism and fishing for their living. The island doesn’t have a bunch of places to explore but the comfort is endless. Another amazing view from the Nusa Lembongan Island is in the night, when the boats in the sea have turned on the lanterns. The tides are mostly low so you can enjoy swimming as well. The water is absolutely crystal clear. Tourists also love to do all kinds of water sports in Nusa Lembongan. You can explore the whole island in a day by walking or renting a motorbike. Tourists are also allowed to visit the seaweed farms in Nusa Lembongan. Several carving shops are also present on the island. Shipwrecks, The playgrounds and Lacerations are the three surfing spots in Nusa Lembongan. 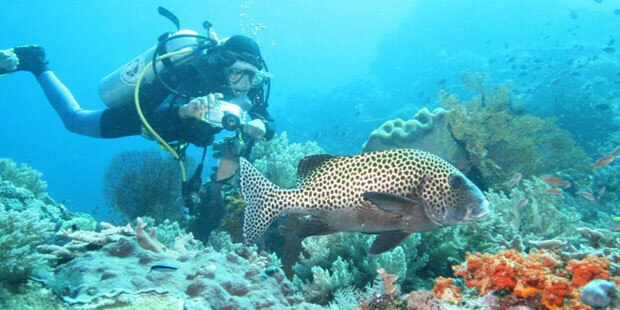 You can also experience scuba diving at the reef. The Hai Beach Club is present for the people to get themselves entertained. The favorable climate is perfect for sunbathing. The food in Nusa Lembongan is exceptional in terms of quality, taste and quantity. The luxury villas in Nusa Lembongan are no less than any other Bali villas in the terms of hospitality, facilities and architecture. Sunset Villas, Villa Shambala, Tanis Villas and Villas Atas are some of the most famous villas in Nusa Lembongan. If you’re looking to relax and enjoy your holiday in a beautiful place then Nusa Lembongan must be your first option.